Several members of Peoples’ Self-Help Housing 45th Anniversary Gala Committee: From left, Clyde Freeman, Kate Schwab, Randy Weiss, Judi Weisbart, Adele Rosen, Rev. Chuck Stacy, Catherine Manset, Monica Scholl and Rochelle Rose. 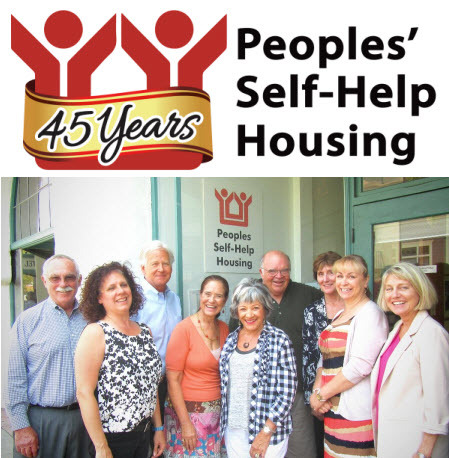 Santa Barbara, Aug. 12, 2015 – Peoples’ Self-Help Housing is proud to announce the members of the working committee organizing its 45th Anniversary gala dinner and auction, the Central Coast Taste of Hope, to be held Nov. 13. The committee is hard at work to put on the special event at the Santa Barbara Historical Museum in celebration of PSHH providing affordable housing on the Central Coast for 45 years. The gala and auction will benefit PSHH’s mission to provide affordable housing and programs leading to self-sufficiency for low-income families, seniors and other special needs groups on California’s Central Coast. Committee members include Lin Aubachon, of Rincon Broadcasting; Jose Flores, PSHH Board Member; Clyde Freeman, of Montecito Bank & Trust; Vito Gioiello, PSHH Board Member; David Gustafson, PSHH Board Member; Catherine Manset, Consultant; Tino Munoz, of Pacific Western Bank; Adele Rosen, Interior Designer; Karol Schulkin, PSHH Board Member; Kate Schwab, of the Downtown Organization; Rev. Chuck Stacy, PSHH Board Member; Randy Weiss, of Union Bank; and Vicki Young, Community Volunteer. PSHH is requesting charitable donations of wine, gift certificates and other merchandise for the silent auction that will be held at the 45th Anniversary event. There is also a limited number of opportunities for vintners to provide tastings for the 200 guests expected to attend. Call Rochelle Rose at 699-7227 or Monica Scholl at (805) 699-7220 or email rocheller@pshhc.org for more information or for donation pick up if needed. Ticket information is available at pshhc.org. Santa Barbara Historical Museum, 136 E. De la Guerra St. Founded in 1970, PSHH is an award winning non-profit organization that develops affordable housing and community facilities for low-income households and homeownership opportunities for working families and special needs populations, such as seniors, veterans, the disabled, and the formerly homeless. With more than 1,100 self-help homes completed and nearly 1,600 rental units developed, PSHH is the largest affordable housing developer on the Central Coast, with offices in Santa Barbara and San Luis Obispo. For more information on Peoples’ Self-Help Housing, visit www.pshhc.org, email info@pshhc.org or phone (805) 781-3088.